Our love for paper plate sewing crafts continues to grow, especially after we made this darling insect sewing craft this week. These cute little insects are a fabulous compliment to the spring season and they are perfect for beginning to teach children how to sew. 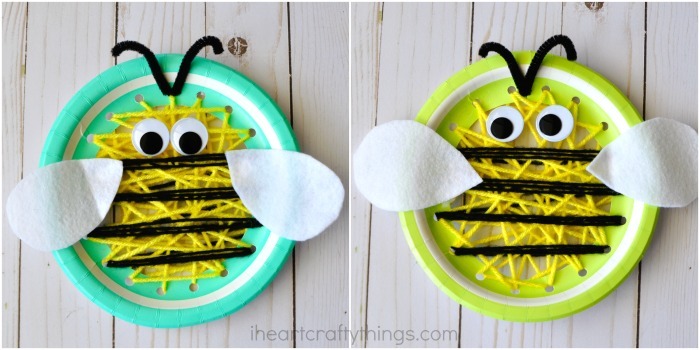 We chose to make colorful bees and ladybugs as our insects but you can get as creative as you want with this fun spring sewing craft. Your little ones may even choose to design their own kind of bug. 1. Place your small bowl on the back of your paper plate and trace it with your pencil. You’ll want to make sure there is some room on the outside of the circle for your holes so don’t make the circle too big. 2. 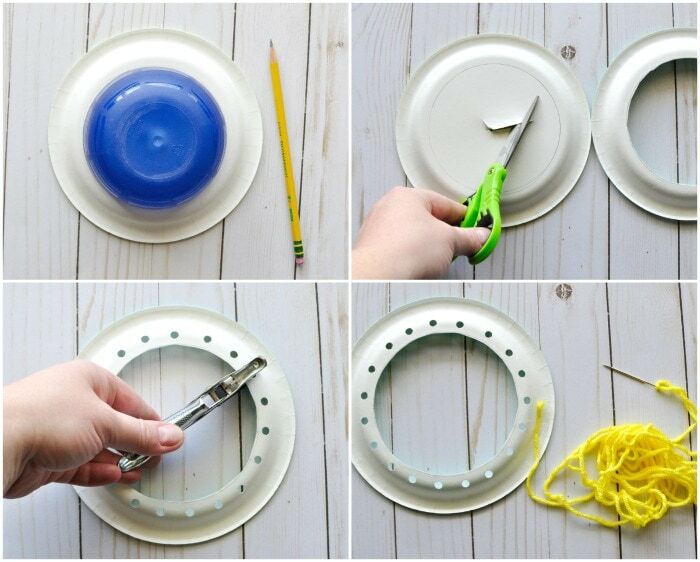 Poke your scissors into the center of your paper plate and cut out the traced circle. 3. Make holes around the perimeter of the circle with your hole punch. 4. Cut off a section of yellow yarn to thread through the holes. The amount you’ll need will depend on how big your paper plate is. The sections we used were about 10-12 feet. Thread one end of the yarn through your yarn needle and tie a knot to secure it in place. 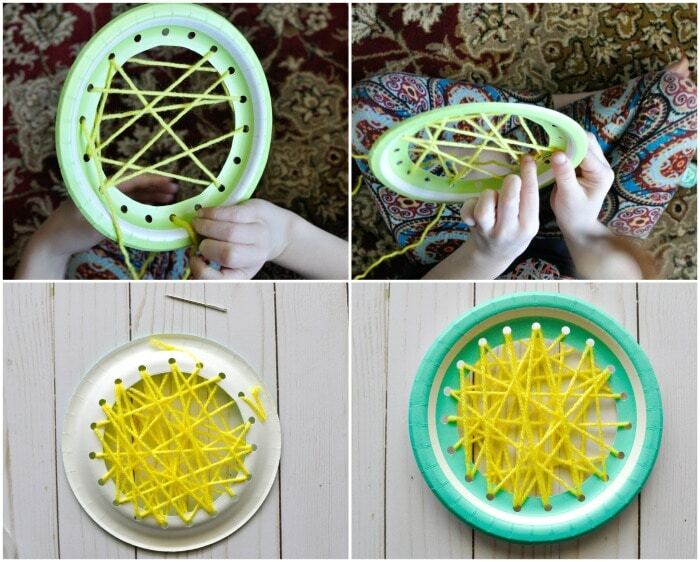 Tape the other end of the yarn onto the back of your paper plate. 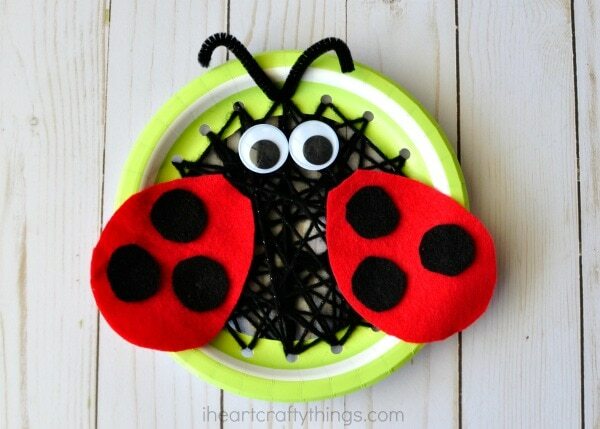 Now it’s time to sew your paper plate insect craft. 5. 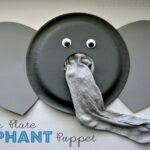 Pull the yarn needle up a hole in the back of the paper plate to the front of the paper plate. Pull the excess yarn all the way through the hole each time you sew. Then continue sewing down and up the holes around the circle until you reach the end of your yarn. 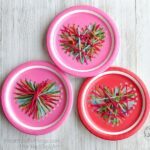 Cut the yarn needle off and tape the end of the yarn onto the back of your paper plate. 6. 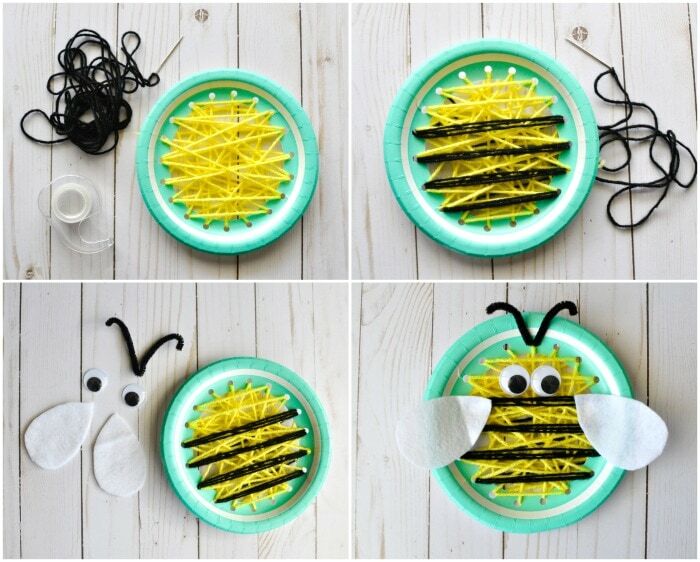 When making your bee, you’ll also need to thread a piece of black yarn and use it to sew stripes across your bee body. We made about 3 passes through each hole in our stripes to give them some thickness. 7. Cut out two bee wings out of your white felt. Also, cut a black pipe cleaner in half for antennae. Fold the pipe cleaner in half and curl down the ends. 8. To attach the bee antennae, poke the folded end of the pipe cleaner down into the hole at the top of your bee. Then fold it up behind the back of the paper plate and tape it in place. 9. 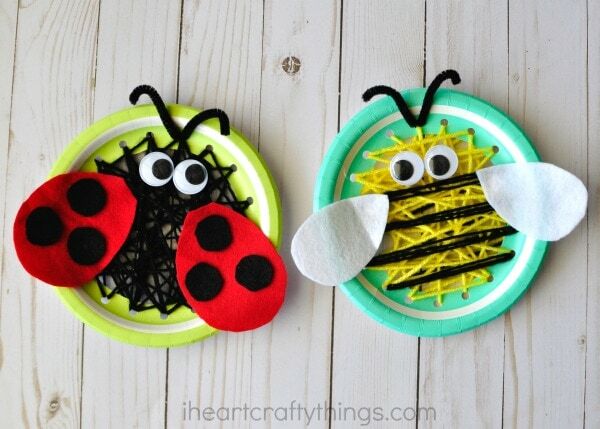 Finish your paper plate insect sewing craft by gluing on your wiggly eyes and felt bee wings with your tacky glue. Above you can see my bee pictured on the left and my daughter’s bee pictured on the right. Besides cutting out the bee wings for her out of the felt and threading her yarn needle for her, she completed the project all on her own. She is a Kindergartner, age 6 1/2. She has done sewing projects like this before so she required little assistance, but kids her age might require more assistance. 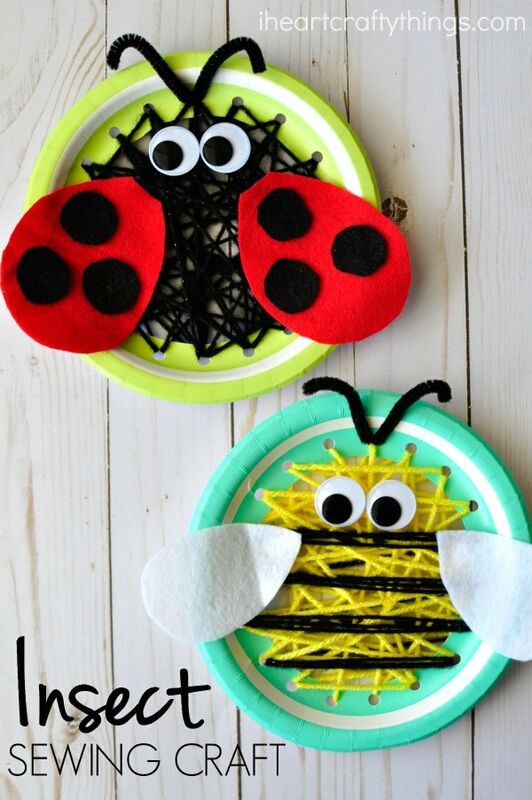 To make the ladybug, follow the same steps we used for the bee except sew black yarn around your paper plate instead of yellow. Then use red and black felt to create the ladybug wings. Aren’t they daring?! We intend to make a few more insects and connect them together to make a fun spring banner to hang up in our home. 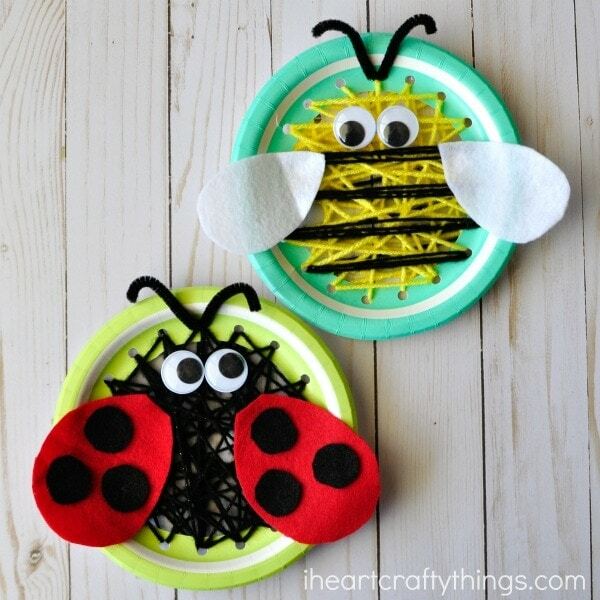 Did you love this paper plate insect sewing craft? 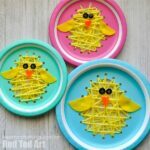 If so you’ll also love this adorable Easter Chick Sewing Craft we made recently. Make sure to check out our Insects category for more awesome crafts to make with your children this spring season, like our recycled bee craft, shimmery dragonfly craft or our gorgeous watercolor butterfly craft.